It's a promise President-elect Donald Trump made over and over this year. Now he has to deliver, and he plans to start by getting tough on two of America's top trade partners: Mexico and China. Trade is often dense and dry. But when Trump takes office next year, it will become front page news that affects you and your wallet. A lot of the stuff you buy at Walmart (WMT) and other stores -- cars, clothes, cell phones -- could become much more expensive. Trump is threatening to impose tariffs on products shipped into the United States from China and Mexico. His transition team has also floated the idea of a 10% tariff on all imports from around the world. That would raise prices for Americans because companies that import from China, Mexico and elsewhere often pass along extra costs to consumers. If your employer does business in Mexico or China, or ships in products from them, there's a chance your job could even be at risk. Millions of American jobs depend on trade with those two nations. If trade shrinks, those jobs could disappear. Conversely, jobs could come back and prices could stay the same for Americans. But most trade experts aren't buying that outcome. It depends how tough Trump wants to get, and how China and Mexico react. Trump's team says it's using the tough talk to renegotiate better trade deals. It's unclear how much of that promise is bark and how much is bite. Learn their names: Peter Navarro and Wilbur Ross. Navarro has been tapped to lead Trump's newly created White House Trade Council. Ross is Trump's nominee for commerce secretary. They are expected to lead Trump's trade policy. Navarro and Ross wrote a paper last summer in which they called China "the biggest trade cheater in the world." Navarro also directed a film titled "Death by China: How America Lost Its Manufacturing Base." Ross says renegotiating NAFTA, the free trade deal among Canada, Mexico and the United States, is a Day 1 priority. Robert Lighthizer is another key player: Sources have told CNN he's a leading contender for U.S. trade representative. Trump appointed his longtime real estate lawyer, Jason Greenblatt, to assist on trade as a "special representative for international negotiations." Why does Trump hate America's trade deals? He blames them for a flood of blue-collar jobs out of the country, arguing that the trade deals have helped foreign countries and hurt American workers. It is true that the United States has lost roughly 5 million manufacturing jobs since 2000. One MIT study found that the United States lost nearly 1 million factory jobs to China alone between 1999 and 2011. But other studies show that trade is not the main culprit for job losses. Machines have taken many more jobs. Along with Canada, China and Mexico make up America's top three trade partners. They've gained manufacturing jobs while the United States has lost them. Trump faults NAFTA for an exodus of good-paying manufacturing jobs from the United States to Mexico. The evidence contradicts Trump: A 2015 nonpartisan report by Congressional Research Service found that NAFTA wasn't responsible for massive job loss, nor was it a major job creator. It's been a slight positive for the U.S. economy, the report found. NAFTA has made it easier for American companies to operate in Mexico. Trump could take away those incentives. China is a much clearer case. It has cheated in a litany of ways, including stealing tech ideas from the U.S. firms and selling products at low prices that U.S. companies can't match because of higher wages in America. Trump plans to label China a "currency manipulator." That title may not be fitting anymore because economists say China is now fighting to stop its currency from falling too much. But the designation would eventually allow the Treasury Department to investigate China's currency practices and potentially levy economic sanctions on China. 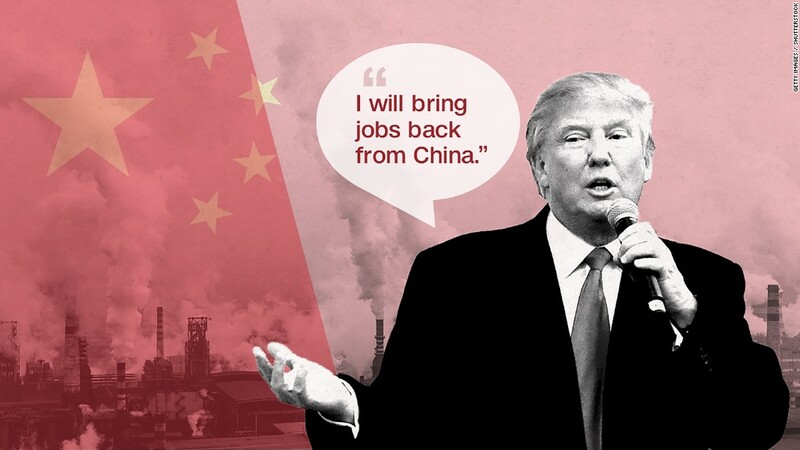 Many trade experts don't see the low-skill manufacturing jobs in China coming back to America. Many of the manufacturing job openings in the United States today are for high-skill workers. How does Trump plan to bring jobs back? Here's where it gets tricky. Trump could take away the incentive for U.S. companies to move jobs overseas by making it too expensive for them to operate elsewhere. One option is the 10% tariff idea, or tariffs on China and Mexico. U.S. business groups object to tariffs, arguing that prices would rise for ordinary Americans and that jobs could be at risk. In terms of companies, Trump can't legally impose tariffs on U.S. firms just for moving jobs abroad, a threat he's made. Another option is something called the border-adjustment tax, or BAT. It's supposed to take away the incentive for American companies to operate abroad solely for tax purposes -- a big reason for some companies. But for the BAT to work perfectly and not raise prices in the United States, the U.S. dollar would have to gain value almost immediately after the BAT is put in place. And there's no guarantee the dollar will move up just the right amount. With either tariffs or a BAT, the concern among some economists is that jobs won't come back, others will get lost and prices will go up, affecting millions of Americans.